MESA/Boogie are famous for making versatile amplifiers but even MESA® fans will agree, with the many Series they make, each uniquely voiced and different, it can be hard to choose. Sometimes your mood or a gig demands a specific character or set of features you’ve grown to love, or a certain favourite with a sound or feel you find nowhere else. Maybe you’ve considered the expressive power of having two amps on tap but didn’t have a way to facilitate using them together? Considered a Dual Rectifier® and Mark V® for example… talk about covering the complete spectrum! And even aside from that type of arsenal, everyone can appreciate the benefit of having an instant back-up amp on a footswitch for gigs. 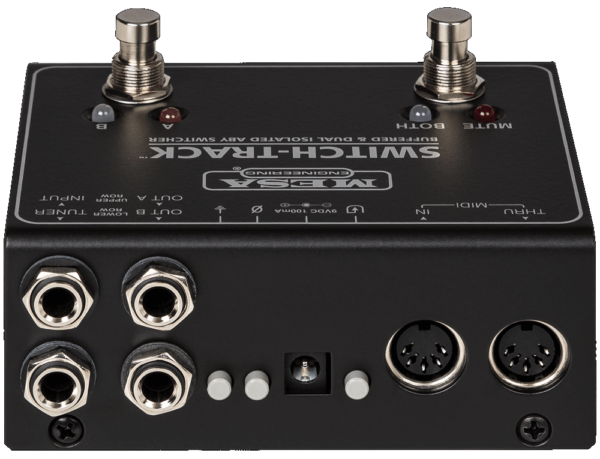 The Switch-Track™ enables an either-or-both, ABY scenario for your two favourite amplifiers. Select between two different amplifiers, two identical amps for more Channels and sonic options or combine them for a bigger, fuller sound, or a specific blended character.